Reinach, Switzerland, 31 January 2019 - Archroma, a global leader in color and specialty chemicals towards sustainable solutions, and Carlin, the trend office who pioneered trend forecasting back in 1947, are heading together to Premiere Vision Paris, where they share a booth fully dedicated to color creativity, inspiration and performance. Carlin is well known in France and abroad for its "trend-oriented" expertise from brand strategy and collection design, to color creation and trend forecasting. Carlin serves famous brands in the fashion, cosmetic or sportswear industry, such as GAP, Empreinte, Byredo, Birchbox, or Samsung. Archroma launched the 'Color Atlas by Archroma®' in 2016, a unique tool dedicated to providing fashion designers and stylists with off-the-shelf color inspiration that can be implemented in production with just a few clicks. The Color Atlas contains 4,320 colors on cotton poplin, and online, almost double compared to similar tools available to textile and fashion specialists. More brands are turning to the Color Atlas and Archroma for color creation and implementation, such as American Eagle Outfitters, Athleta, Express, and Lands’ End. Archroma and Carlin started their collaboration in July 2018. Carlin is using the color references of the Color Atlas during its color workshops throughout France, as well as in its 20 yearly publications. At Premiere Vision, Archroma and Carlin will be together in one exhibition space, allowing visitors to enjoy a full consultation from color trends to color inspiration to color implementation from the first mood board all the way into production. At the booth, Carlin will present its trend books for the Fall-Winter 2021. The IMPULSE FW2021 trend book presents Carlin’s four main themes for Fall-Winter 2021: "INSOLENCE", "TECH-CARE", "LAND" and "ALPHA", with a detailed and inspiring macrosocial decoding and several creative leads for each of the themes. The teams at Carlin and Archroma developed a crush on "INSOLENCE" and decided to make it the inspiration of their shared booth, with its bold red, green and blue colors. 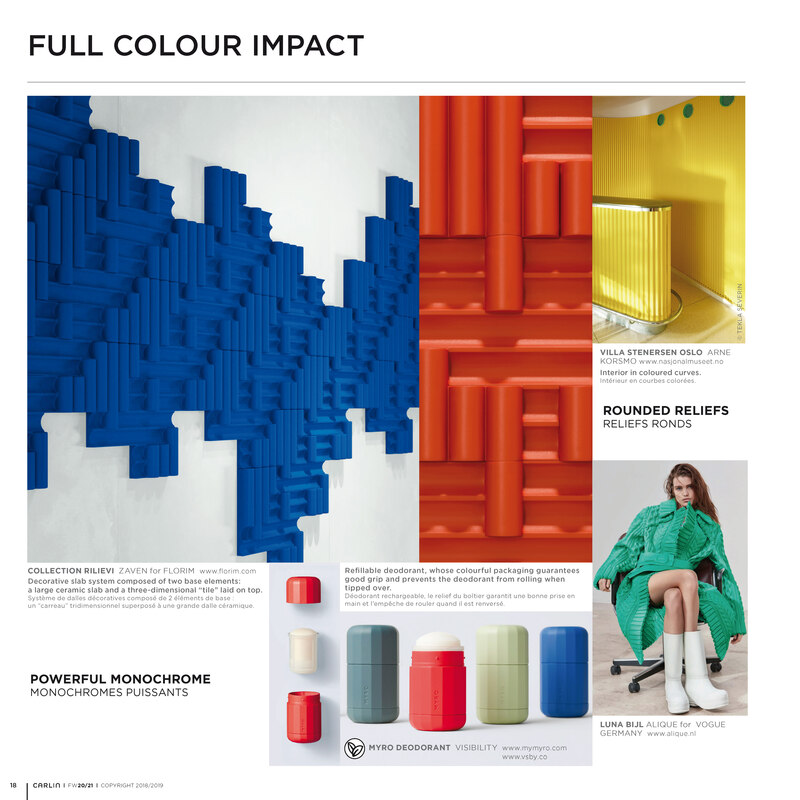 Visitors will be able to experience the theme through the booth design and through an exclusive series of short presentations at the booth for a sneak preview at the color trends under "INSOLENCE". Secure your seat with Annflor Sangan at +33 6 4811 7305 or by email at: annflorsangan@gmail.com. Closing the loop from forecast to insight, visitors at the booth will also have the opportunity to check which colors are currently trending in the textile industry, with Archroma’s “TRENDING NOW” booklet. The “TRENDING NOW” booklet compiles the top 10 selling colors of Color Atlas references that are currently being selected and in-use. Visitors at the booth will also be able to explore Carlin’s take on “naturality & ethics” under its other theme, “LAND”, with Archroma’s most recent color innovations such as the aniline-free* Denisol Pure Indigo dyes for denim, and EarthColors®, a range of traceable dyes made from agricultural or herbal waste such as nutshells or rosemary leaves. “From the color inspiration to color management expertise, our Carlin x Archroma collaboration is unique in that it allows the color dreams of designers and stylists to come to life uncompromised into the collection they bring to the shops”, Edouard Keller, Head of International Sales, comments. Denisol® and EarthColors® are trademarks of Archroma registered in many countries. 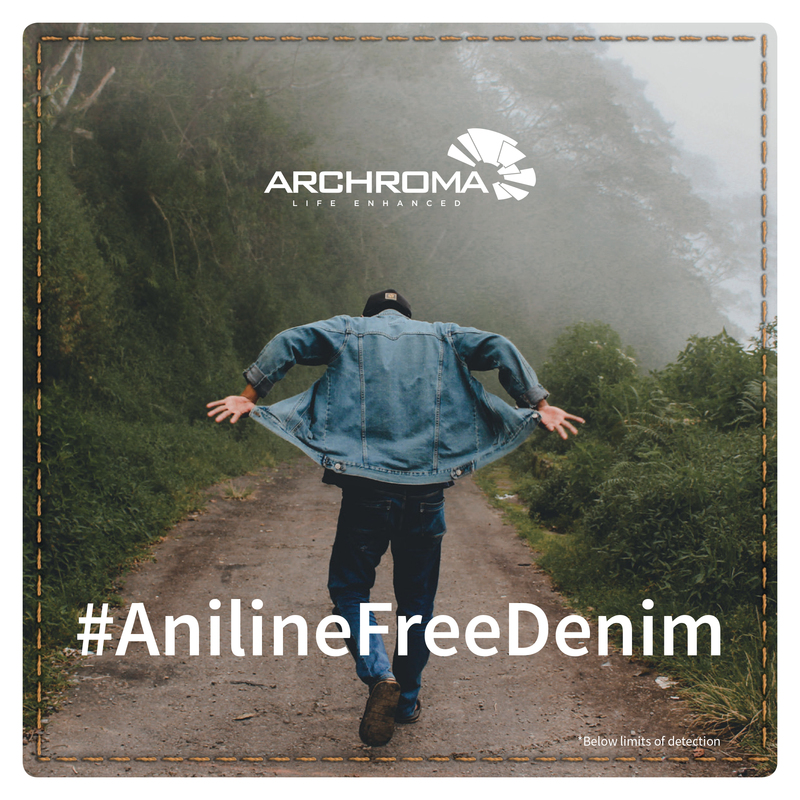 Archroma Color Management provides innovative solutions to manage color standards and palettes along the whole textile chain for retailers, brands, vendors, and textile mills. Archroma offers the required tools—through web-based software and customized services—for color searching, color matching, color standards, and the communication of seasonal color palettes. Archroma’s goal is to help its customers achieve accurate color and accelerate their time to market with our tools, services, and support systems. 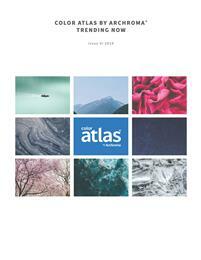 Founded in 1947, Carlin is the world’s first Trend Forecasting Bureau. Headquartered in Paris, Carlin is represented in 25 countries. Carlin teams detect and study the social trends and the new consumption behaviours in order to deduce commercial, perennial and creative solutions, which will make the success of their clients. Carlin’s expertise blends creative vision with empirical, data-oriented analyses. This researches are compiled in trend books and instil Carlin consultancy offer (branding, collectioning and communication). Page 18 of IMPULSE FW2021 trend book to be presented by Carlin at Premiere Vision Paris, February 12-14, 2019. Page 1 of Archroma TRENDING NOW booklet to be presented by Archroma at Premiere Vision Paris, February 12-14, 2019.